Former Israeli President Shimon Peres is in intensive care after suffering a serious stroke, medical officials say. Doctors at the Sheba Medical Centre near Tel Aviv, where he is being treated, said Mr Peres, 93, was "in a critical condition but stable". Mr Peres' son-in-law and personal physician said there was "no imminent threat to his life", adding that he had a "pretty good chance of survival". Dr Rafi Valden said Mr Peres was responsive - he had squeezed his hand. There was "certain optimism" after doctors "lessened the dose of sedation", he said, adding the former president was being sedated and ventilated again to let his brain recover. "We were happy to see that he was reactive, he was responsive," Dr Valden told journalists. "We are definitely convinced that he is awake and listening and reacting," he said, adding that it was difficult to establish his neurological condition while sedated. Doctors had earlier said the stroke had caused "lots of bleeding". 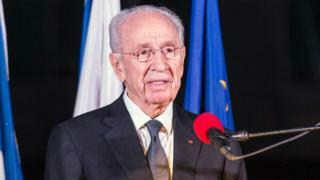 Earlier reports indicated Mr Peres had been put into a medically induced coma. Doctors later said he had been sedated and intubated. Mr Peres' son, Chemi, said the family was going through some "difficult hours". "I'm optimistic. I'm a great believer in my father. He's a unique person. And I pray with all my heart, together with my family, that things will improve from this point on," he said. Dr Valden said the former president had been taken to hospital for examination after feeling a "vague head ache" and "some weakness". While there, he had a stroke in the right side of the brain, he added. Prime Minister Benjamin Netanyahu tweeted: "Shimon, we love you and the entire nation is wishing for your recovery,"
In January, he underwent successful minor surgery at the same hospital after suffering a small heart attack. The veteran politician has held almost every major political office since Israel was founded in 1948, and was the architect of Israel's secret nuclear programme. He twice served as prime minister and was president from 2007 to 2014. He won the Nobel Peace Prize in 1994 for his role negotiating the Oslo peace accords with the Palestinians a year earlier, a prize he shared with Prime Minister Yitzhak Rabin, who was later assassinated, and Palestinian leader Yasser Arafat. Despite his age, Mr Peres has maintained an active public schedule, mostly through his non-governmental Peres Centre for Peace, which promotes closer ties between Israel and the Palestinians. Hours before his hospitalisation, Peres uploaded a video to his Facebook page urging people to buy local products. When leaving hospital after his heart treatment in January, Mr Peres told reporters he was "so happy to return to work, that was the whole purpose of this operation".